So you've probably heard and read one to many "new year, new me" status' and posts over the last week or so, I will promise you now that this isn't another one of them! I always find January so motivating in making changes and starting a fresh, whether it's a small change or something big in your life, it's great to turn over a new leaf as cheesy as it is and focus on the fun year ahead! So I've come up with a list of things for you guys to maybe try out to get your new year off to a great start! Been umming and arring over a certain celeb style for months now? Go for it! Want to go for the chop, or try a fringe out? Maybe you're thinking of turning those blonde locks brown? Even if it's a new snazzy shampoo and conditioner to treat yourself with, give it a go! A new do can make you feel a million dollars! 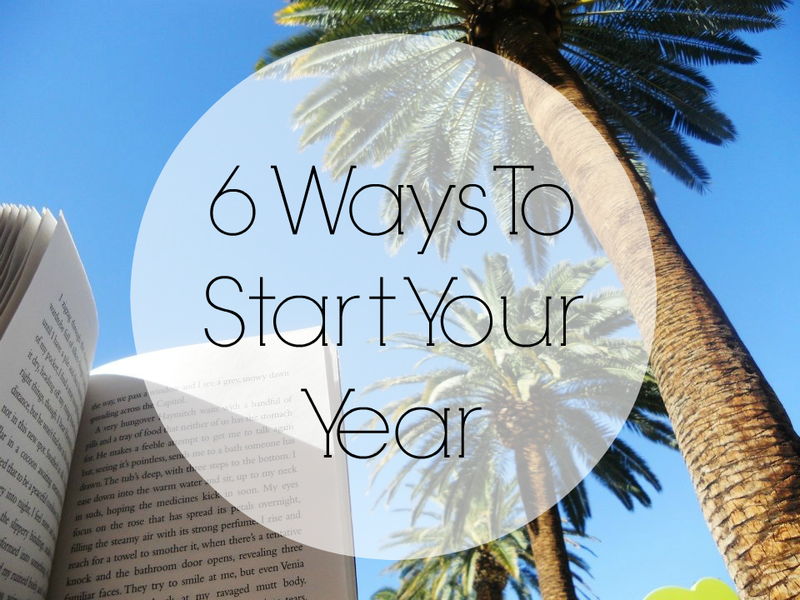 Starting a new hobby is a great way to opening up yourself to different experiences in 2015! Whether it's joining an exercise class, starting up your own blog or maybe even a cheeky bit of baking! Set aside time each week for it and see your skills progress... you never know you could be on The Great British Bake Off before you know it! Music can have a huge affect on your emotions, there are some songs out there that make me so happy that I can listen to them on repeat over and over and I will never get bored and I BET you have songs like this too! So.... get those favourite songs in a playlist and listening to it whenever you can! When your getting ready in the morning, when your driving, when your running, when you're feeling down - and it will instantly get you in a funky fresh mood! Add and remove songs whenever you want and always keep it on shuffle so it's not predictable! There's nothing nicer than buying yourself a new perfume! Get yourself in the right frame of mind with a gorgeous new perfume so that every morning when you put it on you have a feeling of positiveness - is that even a word?! I recently bought Katy Perry's Royal Revolution in the boxing day sales and I LOVE it! I've worn it everyday since buying it! I did this on New Years Eve and it made me feel so so much better about myself and the surroundings I live in! Messy home, messy mind - that is how I work. If my flat is messy it makes my brain scatty and I just can't think straight! On NYE I went on a full-on mission to get rid of all the products and unnecessary crap that I have accumulated over the last year or so! I boxed and bagged most of it up and gave half to my lovely mummy and the other half to some of my lovely friends! It felt so good to get it out of the way knowing that it was going to be used and enjoyed by my nearest and dearest instead of sitting in a box waiting to one day maybe be used or to be chucked away! Happy New Year guys and once again thank you so much for reading and supporting A Yellow Brick Blog - hopefully 2015 will be the best year yet! Such great ideas! I'm such a hoarder but REALLY need to get throwing things out so I can feel less cluttered! I'm off to go and make a happy playlist right now - thanks for the idea! Great little list. I love the aim a day - makes it a little more manageable - and I definitely need to unsubscribe to some emails!! Great tips. I always have a good tidy on Nye. Amazing list and I have to try these out especially the hair makeover as I want to try something new. I think one small aim a day is a fantastic goal. Is it sad that all of the above scare me? Although I do seriously need a clear out. Great post! I can definitely do at least a few of these. Some I've already done! Aim a Day is such a great idea! It's so easy to get lost and overwhelmed with our big resolutions, when small and consistent is the way to go! An aim a day sounds great, doing one thing a day is better than nothing. I am going home tonight and making a happy play list!! This is a fab post babe :) Getting my hair done next week and hopefully going blonder!!! i love this! really need a new wardrobe. new year new wardrobe right? These are so fab. I am aiming to do something each day, writing it all down in my diary so I can reflect at the end how good this year has been. Loved reading this! Has some excellent ways to mix things up a bit; things that I never even considered. Just listen to that crescendo at the end of “Crying.” Never has a song about romantic despair sounded Timberland Outlet online quite so triumphant in its heartbreak. But in person, Orbison was weak-chinned and scrawny (and, later, weak-chinned and doughy), with an indoor-kid pallor. There were persistent, false rumors that he was albino, or that he wore dark glasses because he was blind. Timberland Sale Growing up, he was self-conscious about his hair, which was so pale it appeared white. When your several attempts to ward off the economic chaos with limited salary has floundered and additional funds are needed, Text Loans can be acquired from the lender. This deal being available with an ease, you will be withdrawing the generous amount in a short time of flaunting the application form to the lender with some of your legit details mentioned in. This short procedure will not be taking a long time and you will be freed from all kinds of unnecessary formal rituals as well. Just make a quick visit online and borrow the finances that will suit your requirements and desires perfectly and you will have an easy time to reimburse the finances back on time. Maintaining this upfront may even help you make use of two-wheeler straight away in the brand-new locality. Moving incorporates risks and these perils are higher the all the additionally dealing with it incorporates. In like manner the damages are higher the more critical your advantages. In this way, insurance is no longer a choice yet a need as to moving.